Many siege weapons hurl large objects, such as boulders, through the air to smash down upon the enemy. However, armies that deploy airborne troops can transport weighty objects into the air and drop them more directly upon foes. These bombardments follow the rules for falling objects. Aerial bombardiers might be creatures such as giant eagles trained for such missions, troops under the effects of a fly spell, or a creature flying with a stack of rocks on a carpet of flying. An object might also be sent aloft by a telekinesis spell or similar magic. Creatures defending a wall or cliff might push or drop objects over the edge. A creature that has a fly speed can move at full speed while carrying aloft an object that does not exceed its light load (if carrying a medium or heavy load, its speed is reduced by one-third). Heavier objects deal more damage, and the damage increases with the distance the object falls. However, bombardment from higher altitudes is less accurate. The range increment of a dropped object is 50 feet. Objects dropped from altitudes higher than 250 feet are always considered indirect hits (see below). Attack Rolls: The creature dropping an object makes a ranged attack roll against AC 5 to hit a square directly, applying any penalty for range increments and a -4 penalty for using an improvised weapon. In addition, the creature's maneuverability may provide a penalty: -2 for average maneuverability, -4 for poor, or -6 for clumsy. An attack that misses hits a nearby square; see Missing with a Thrown Weapon). Damage: The damage dealt by a dropped object is based on the weight of the object and the distance the object falls, as noted on falling objects. A creature can avoid damage from the attack by making a DC 15 Reflex save. Dive Bombing: A diving creature gains more control over the trajectory of its payload and gets a +2 bonus on the attack roll. Range increment penalties, if any, are calculated from the point where the object is released, but for the purpose of determining damage, the length of the dive is added to the distance the object has fallen. Dive bombing is treated as a charge, imposing a -2 penalty to the diving creature's AC. Flyers with clumsy or poor maneuverability need to remember to leave themselves enough maneuvering room to avoid crashing into the ground or target. In most battlefield situations, archers don't pick particular targets for their shots. Instead, large groups of archers concentrate their shots on an area occupied by enemy troops, ensuring by sheer volume of projectiles that something will be hit. Despite the name of this tactic, it can be attempted by any characters wielding projectile weapons, such as crossbows or slings. The rule presented here originally appeared in a simpler form in Complete Warrior; this information updates and expands on that material. If at least ten archers are in a contiguous group (each one adjacent to at least one other), they can loose a volley of arrows as a full-round action. Rather than aiming at a specific target, they concentrate their arrows in a general area, hoping to hit whatever's there. Each archer fires a single arrow, regardless of her normal rate of fire. The commander of the archers (generally an officer or veteran soldier, who need not be one of the archers himself) makes a special attack roll against AC 15, using only his base attack bonus, Intelligence modifier, and any range increment penalty. If the attack hits, arrows land in the target area, which has the same shape as the archers in the group. For example, if two rows of five archers hit with an arrow volley, arrows land in a 2-square-by-5-square area. An arrow volley that misses its intended target still lands somewhere. Refer to the diagram Miss to determine the misdirection of the attack. Since the target area is larger than a single square, the archers' commander must designate one square at or near the center of his formation to correspond to the target square in the diagram. It is entirely possible for an arrow volley to be slightly off target yet still hit a portion of the target area because the area in which the volley lands may overlap the intended target. Any creature in a square where an arrow lands takes damage from the arrow unless it makes a DC 15 Reflex save. Modifiers might apply to the save DC, as noted in the table below. Each arrow deals normal damage, including Strength modifiers if appropriate. *Apply the lowest bonus among all the arrows. For example, ten 1st-level warriors wielding longbows each fire a single masterwork arrow as part of a volley against a target area 150 feet away from the most distant archer. Assuming the commander makes her attack roll to hit the designated area, each creature in the target square takes 1d8 points of damage, with a DC 14 Reflex save to avoid this damage (base DC 15, -2 because the square is two range increments away from the most distant archer, +1 for the enhancement bonus from the masterwork quality). A typical volley of arrows is fired in a high arc, rather than directly at the target square. This kind of attack requires additional vertical clearance to accomplish, making a volley difficult or even impossible in most dungeon environments. The top of the arc reaches a height of 10 feet per range increment (or fraction thereof) of the volley. A volley of arrows fired from longbows at a target 450 feet distant reaches a height of 50 feet (since 450 feet is more than four range increments for a longbow). Because of this arc, an indirect volley can ignore cover (even total cover) between the archers and the target, as long as the arc is high enough to clear the cover. For instance, a 20-foot-high wall midway between volleying archers and a target square 300 feet away offers no protection against the volley. A volley cannot ignore total cover within 10 feet of the nearest archer or within 10 feet of the target square; such cover prevents a volley attack entirely. It's possible to fire a volley of arrows as a direct fire attack, rather than an indirect fire attack. Such an attack is not capable of targeting areas behind the enemy's front line and may not ignore any cover between the archers and the target area. Archers delivering a direct fire volley can target a square only if each character participating in the volley can draw at least one straight line between his square and the target area without being blocked by cover. Archers who perform an arrow volley can focus their attention on a smaller area than normal. This kind of attack is called a concentrated volley and is capable of dealing a significant amount of damage. To produce a concentrated volley of arrows, up to ten contiguous archers focus their fire on a particular 5-foot square. Each archer makes a full attack, firing as many arrows as he chooses (and is capable of firing). The leader of the volley makes a special attack roll (as noted above) against AC 20. (It is not possible to score a critical hit with this special attack.) Success means the volley hits the target square; failure means it hits some other square (again, see Miss). 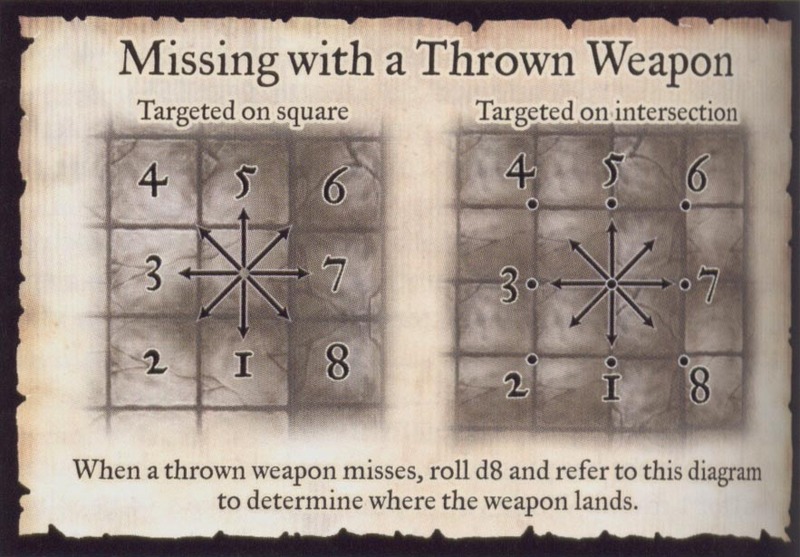 All creatures in the target square take damage as if they were hit by one-fifth of the arrows fired (1d6 points of damage per five arrows fired from shortbows, or 1d8 points of damage per five arrows fired from longbows). If the arrows don't all deal the same damage - because they are fired from different bows or because of damage modifiers that apply to some but not all attackers - use the damage dealt by the most arrows in the volley as the default damage value. A target that makes a DC 15 Reflex save takes half damage. Modifiers can adjust this save DC, as noted in the table above. For example, ten 1st-level human warriors with the Rapid Shot feat each fire two masterwork arrows from a longbow at a designated square within line of sight, 150 feet away from the most distant warrior. If the attack succeeds, each creature in the target square takes 4d8+4 points of damage (one-fifth of twenty arrows is four arrows), with a DC 14 Reflex save to reduce this to half damage (DC 15, -2 because the square is more than one range increment from the farthest archer, +1 for the enhancement bonus from the masterwork quality). The type of damage dealt by the volley is normal for the projectiles being fired (typically piercing, for arrows). If all arrows share the same enhancement bonus, magical property, or other special ability that applies on damage rolls, add this to the damage dealt by each arrow in the volley. For example, if all arrows fired in the volley described above were +1 flaming arrows fired from a composite longbow (+1 Str bonus), the damage would be 4d8+8 piercing plus 4d6 fire (Reflex half). Special properties that don't directly affect the arrows attack rolls or damage have no effect on a volley. For instance, a volley often +1 seeking arrows would add +1 to the Reflex save DC and +1 to the damage roll (as normal for +1 arrows), but the seeking property would have no effect. It doesn't do any good to have more than ten archers focus on a single square in a single attack. Typically, larger groups of archers divide their efforts to target additional squares (in teams of four or more archers per square), or split up their attacks to focus on the same square on separate initiative counts. For instance, a group of fifty archers can target the same square with concentrated volleys on five different initiative counts, or they can split up to cover five different squares with concentrated volleys. A character capable of deflecting arrows, such as one with the Deflect Arrows feat or the Block Arrow feat, can ignore some or all the damage dealt by an arrow volley. Against a normal arrow volley, any character capable of deflecting one or more arrows per round takes no damage from the volley. Against a concentrated volley, such a character takes less damage than normal. To determine the damage dealt by a concentrated volley, reduce the effective number of arrows in the volley by twice the number of arrows the character can deflect or block each round. Thus, a fighter with Block Arrow targeted by a concentrated volley of eight arrows takes damage as if only six arrows were fired. An epic-level character with the Infinite Deflection feat takes no damage from concentrated volleys.